PHILADELPHIA – Last Monday at a hastily called surprise meeting, the Philadelphia School Reform Commission (SRC) voted 5-0 to cancel its contract with the city’s teachers union. The members of the Philadelphia Federation of Teachers (PFT, AFT Local 3), the largest of the unions representing the district’s school employees, have worked without a contract since September 2013. 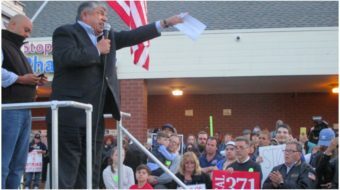 The SRC is the state body established by law in 2001 to operate the city’s public schools, allegedly to rescue the district from its financial and educational “distress.” Now, after thirteen years of state oversight, the district’s financial condition is worse than ever, and news stories have documented the ravaging of the district’s finances by local banks and out-of-town educational consulting companies. This latest move by the SRC came as a shock, but the school district’s current crisis is of long making and has intensified over the past year. It brings to a head several issues that have come together during the current academic year. For a period during the governorship of Democrat Ed Rendell during the mid 2000s, the district actually saw funding increases, bolstered by federal stimulus funds, and modest gains in student achievement. With the end of the stimulus funds and the failure of the new Republican governor Tom Corbett to make up the difference, the district saw drastic funding cuts from 2011 onwards. Philadelphia’s Democratic controlled City Council did pass legislation to make up some of the shortfall, but the district has continued to face deep long-term funding deficits. Other unions representing non-teaching and support personnel have been forced to accept cuts, and nurses, counselors and other PFT members have been laid off. The situation has been aggravated by the increasing number of charter schools in the district, which now enroll approximately one-third of the city’s over 200,000 school age youngsters. At the schools administered directly by the district under the SRC, enrollment has declined to about 130,000 students. The condition of public schools across the state has become a key issue in the current gubernatorial campaign, with Democrat Tom Wolf calling for taxing the profitable extraction of natural gas from the Marcellus shale region, which covers much of northern Pennsylvania. Governor Corbett’s refusal to address the shale gas issue as a possible partial solution to the school funding crisis is one reason he trails in opinion polls by double digits. The Philadelphia Daily News, one of the city’s two major dailies, labeled the governor’s arguments for not taxing the extraction of natural gas “bunk” and argued in an editorial on October 1 that the 5 percent tax being proposed by candidate Wolf would raise $500 million in the first year and that the amount would likely rise along with increasing gas production in the future. The SRC claims that the only changes to be imposed at this time would be to the employees’ health care plan and that, starting December 15, employees would begin seeing payroll deductions of from $20 to $200 per month, depending on each employee’s coverage and salary. At the same time, the district administration is claiming that their action does not constitute a pay cut, although some employees could see pay roll deductions of hundreds or thousands of dollars a year. 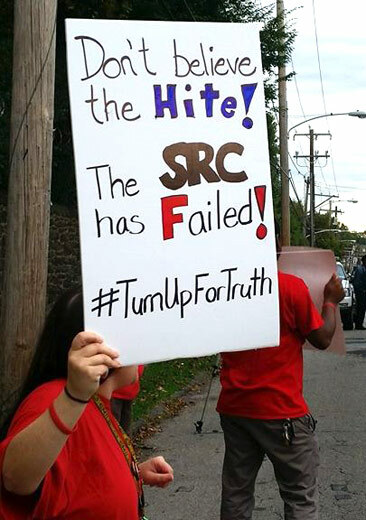 The teachers union and community allies have called a major demonstration for next week’s Thursday meeting of the SRC. Demonstrations there have become a regular event over the last two years. Photo: Philadelphia Federation of Teachers, Facebook. 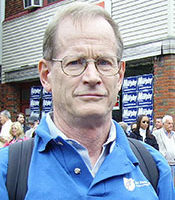 Union and community activist Ben Sears taught for the Philadelphia School District. He lives in Philadelphia, Pennsylvania.